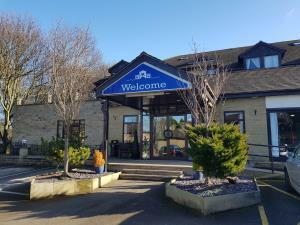 Best Western Hotel St Pierre01924 255596work HotelAt BEST WESTERN Hotel St Pierre, Wakefield, pride themselves on theirfriendly and professional hospitality and aim to make your stay with them an unforgettable experience, for all the right reasons. Located in the pretty village of Newmillerdam, on the Southside of Wakefield. You are only minute’s drive to the M1 Motorway with easy access to the M62, Normanton, Pontefract, Barnsley, Leeds, and Sheffield. So whether you're staying for business or leisure, you will receive the perfect combination of great value and comfortable accommodation in the perfect location. Offering 54 bedrooms, 4 conference and dining rooms, restaurant and in house spa. You will find Hotel St Pierre's Stylish Lounge Bar is the perfect place to relax on your own or in company, where you can enjoy various hot and cold beverages and meals from the lounge menu. In addition, the Lounge Bar has Cable TV, where you can enjoy various channels including BT sports. Newly refurbished. Free internet access. Children welcome from any age. Leave the city centre on the A636 (Denby Dale Road). At Pugneys Country Park roundabout, take 2nd exit onto A61 (Asdale Road) signposted Barnsley. At traffic lights turn right, continuing on the A61 Barnsley. Pass Newmillerdam lake and Hotel is located on the left, visible from the road. Leave the M1 at jct39 and follow signs for Wakefield City Centre. At 2nd roundabout, take 3rd exit onto A61 (Asdale Road) signposted Barnsley. At traffic lights turn right, continuing on the A61 Barnsley. Pass Newmillerdam lake and Hotel is located on the left, visible from the road.